News has been received in this city of the death of O. B. Ferguson at his home in Chicago Sunday. Mr. Ferguson was for many years, a resident of this city, being engaged in the hotel business, first at the American House, and later at the Van Ness House, with his brother-in-law, the late D. C. Barber. Eighteen years ago he went to Chicago, and lived in that place up to the time of his death. 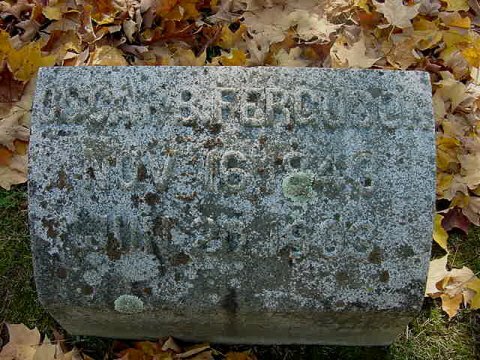 Mr. Ferguson was born in Huntington in 1843, and had a brilliant Civil War record He enlisted Sept. 30, 1861. in Co. A., First Vermont cavalry, from this city, and was mustered into service Nov. 19, 1861. He was promoted to regiment commissary sergeant in Oct., 1862, and was taken prisoner in April 1863, at the battle of Blood River, Va. . He was paroled April 7, 1864, and received an honorable discharge Nov. 18, 1864. . During the war he participated in no less than 66 battles. He is survived by a wife and a step-sister, Mrs. Hiram Walker, and a niece, Mrs. Dora Oakes, of this city.